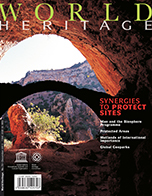 World Heritage is the official UNESCO publication from the World Heritage Centre co-published with PFD. 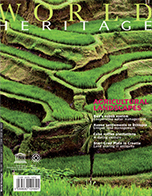 Established in Paris in 1992, the World Heritage Centre is the focal point and coordinator within UNESCO for all matters related to World Heritage. 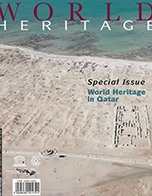 The quarterly review is produced in English, French and Spanish with stunning photographs, insightful features and interviews, and news from UNESCO’s partners, events and World Heritage sites. World Heritage is distributed to governments, World Heritage Committee members, UNESCO national commissions, academics, supporting organizations and to national tourism boards. It is also available at key events including the Sessions of the World Heritage Committee and the General Assembly of States Parties, meetings of the Organization of World Heritage Cities, and the most important trade fairs for the tourism industry including ITB Berlin, FITUR, FITA Mexico and the World Travel Market. 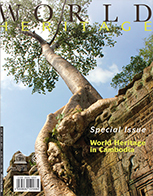 World Heritage is a superb publication. Beautifully illustrated and laid-out, it is authoritative and relevant to those involved directly in work associated with the World Heritage Convention and anyone with an interest in natural and cultural heritage. Gord Jones, Project Manager, Pimachiowin Aki Corp.